Learn more about Messenger marketing from Mikael Yang. Also, please find the whole transcript below. Balint Pataki: Thank you and welcome to the podcast. Thank you that you made time again and accepted my invitation. Many of us are familiar with ManyChat and your work in ManyChat but can you just give us a little bit of background where are you coming from, how did you come to bots and the idea of establishing a company in this age. Mikael Yang: Sure. ManyChat is a messenger marketing platform and we help small and medium business to do marketing sales and the support through Facebook Messenger. Right now we power over a hundred thousand businesses in over a hundred countries around the world and we started this in 2015 when Telegram Messenger opened up their API and that was Telegram Messenger for those listeners who don’t know, it’s a messenger that is popular in other countries solves the same problems as WhatsApp and Facebook Messenger and Telegram opened up their API in July 2015 and we’ve created a platform for broadcasting messages to your Telegram Bot subscribers because we saw an opportunity to give people an option to communicate one to many through this channel and before that the only thing that people were doing on messenger is basically communicating one on one or in small groups so this concept of broadcasting messages to many people through messenger was still not known to anyone. We’ve built a platform that made it really easy to do it and grew virally and a year later when Facebook opened up their API we just knew what had to be done on that platform and we’ve built ManyChat for Facebook Messenger and now we are powering messenger businesses helping them to do marketing through this channel. The only reason to switch over or to add messenger to your marketing mix is because you are getting 10x engagement than through channels like email. Balint Pataki: I think we will talk about the engagement a bit later. What was your first Bot experience? Was it via telegram, these so to say newsletters or grant communication or was that something that made you curious? Mikael Yang: My first Bot experiences were in the times of ICQ and IRC wherein there would be these artificial entities, these bots that would perform some kinds of actions inside of group chat. For example, they could count your karma or they could facilitate an exchange between the groups between the participants inside the group. Also, I remember there was a Bots on the public servers of Warcraft for computing the Defense of the Ancients’ rating. You could ask that Bot what’s my raring, what’s that person’s rating et cetera. That would be the first encounters of Bots and if we’re talking about specifically Bots on messengers that would be telegram. Balint Pataki: You started with telegram, did you already see that probably you’ll drag it along other platforms as well and possibly bigger platforms or you were already excited that telegram is big enough to have a huge opportunity in this space. Mikael Yang: I think both things are correct. We saw how all the platforms would eventually need to open up their APIs because if you want businesses to be on your platform you got to give them tools to communicate with their customers and the fastest way to do that is to open up the APIs and give the third party developers an ability to create those tools for the businesses and to market and sell those. But still, we were already excited about telegram itself because the platform had over at that point was 60 70 million users. Right now it’s over 100 million users and it was already an interesting market for us to start working in but of course, Facebook Messenger opened up that’s an even bigger market. If you have to spare resources you got to make a decision where you’re going to play. Balint Pataki: You had a head start in this race to build platforms without coding because that’s where most people already. They are either small business or marketers and they don’t have the coding of each but they still want to participate in messenger marketing. Since you started the market grew a little bit. Can you tell us how it changed? You said already that you have already over a hundred thousand Bots or businesses. Was your market share, is that a public thing? Mikael Yang: We don’t know the market share because we don’t know the total number of Bots but I’m sure it’s pretty high. In terms of messenger marketing we are the number one platform and in terms of the number of Bots connected I don’t know the stats of the other Bot but I’m pretty sure we’re somewhere in the top. What was the other question? How the market has matured, yeah. It started with people just first of all when we transitioned from telegram to our focus on Facebook Messenger, we asked ourselves do we want to build this massive platform where anybody can build Bots or do we want to narrow it down to a specific set of customers and build a perfect platform for them? Our decision was to narrow it down the businesses to marketers who actually want to get results for their business, who want to get leads, who want to nurtures those leads, who wants to convert those leads and who wants to entertain those lead and those customers and to provide a better customer service for them. Our need was specifically business used cases and marketing use cases. We started with that and the market has matured quite a bit over time because at start there were all these early adopters and the betarers who are just trying things out or really excited about the platform who have heard about like this Bot type and gorgeous like they thought that Bots are cool and they need to learn about them. That was the first people that came on to the platform and tried to use it in the first half a year. Of course, when you have people who are just coming in because they are curious those people are not going to stick. Those people don’t have an actual used case in their minds. They don’t need a problem solved. They are just excited and that’s fun but if you want to capture value, you want to bring value and then capture some of that value you got solve a natural business used case. That’s when marketers started discovering us and actually sharing their results with everyone because a marketer would come and would get 300% ROI, 400% ROI like there is an article by digital marketer about 500% ROI and a lot of them were educators who are experts in the field who are just looking for new channels for things that’s for untapped opportunities and when they got those results they just went out and told everyone about it and that was the thing that drove our growth in the beginning. It’s the marketers getting results ensuring with other people. Balint Pataki: Actually, I like that you, you said that because that was motivation as well and I learned about Chatbot I was like yeah, that’s cool in a way. Then Facebook opened up their platform to advertise directly into messenger. Messenger became an added destination of our people, click on the image and they got a message. I was like okay, this is something that I really have to explore. I actually I established this company and podcast from it. I actually can recall that to you, reference to your company as a messenger marketing, more like messenger marketing and automation company then to your bot company, do you think these bot automations are just not there yet as Facebook was so a little bit scaled down with the user inputs are and enabled that you can even forbid the users that they directly type into the messenger? Mikael Yang: Yes and no. First of all yes we saw that from our telegram experience that bots are not about direct communication chatting or of course, there are used cases for that kind of interaction but for the most part you just want to get the job done. The customer has some kind of a request. They want a book, they want to get the info, they have something that they want from the business and that’s why they’re talking to this business. They’re not there to have a chat. Some of them are but 90% of them are there like it has to solve some actual problem for them. The quickest way to solve a problem is to provide a graphical user interface. When you encounter just an input where you can type anything like the question that’s in your mind is, is this thing going to understand me? What can I type here? With that examples you’re going to know what you can type and then the machine starts to ask you some more questions because it needs to process that into an actual thing, an actual request that it can forward to an API or something or to a human. We discovered that typing is not the best way to interact with the bots and that buttons are much more efficient and much more understandable like much more convenient for the customers and much better for the businesses because it’s easier to setup, it’s easier to analyze the engagements et cetera. When we started doing a messenger marketing Facebook, we didn’t have any way to interact with the bot besides buttons. Now we already have some forms of input where people tend to actually type a stuff in because there are cases where that is very valuable and of course there’re going to be more and more done through this kind of automation. But I don’t think that buttons are going anywhere because it’s much more convenient to just press something and get it then to type out your request. That would be our stance. We think that both of those things are important but right now you got to build from the basics. Balint Pataki: Exactly and in my opinion, people are a little bit passive on the side with all these smartphones and all these instant things. It’s probably the easiness of typing. If you have a question about duration like do you plan to move in the next six months, three months, next year whatever, it’s just much easier to talk about it than type it out. As you mentioned that there has to be a used case. I really love how you asked me probably many other marketers about what specific thing could make ManyChat better, what would be the used case of it? I also noticed that even your CEO of this tremendously growing company you still take the time to keep a one on one context to many people and you suggest that they contact you via messenger. Something I noticed that messenger can be a little bit overloaded like when you use it a lot and talk to a lot of people and especially will be the case if there are more and more brands coming to it. How do you see the future for messenger itself from a user standpoint? Will there be more filters like in email? Would there be people probably signing up more accounts because of this or would there be plugins maybe like as Gmail has? Mikael Yang: Yeah. I think the like if you’re talking about information overloads and being subscribed and having too many conversations on messenger, I think there are two ways this could go. First is going to be a self, the people are going to organize their communication brands themselves. If they get overloaded with messages on messenger they will start unsubscribing from brands that they don’t want to hear about. The beauty of messenger is that when you unsubscribe from some page you never hear from that brand again and it’s not like email where you can just re-upload somebody into the database or use another service so there is like zero spam on messenger. The customer is always in control who he is talking to but we know that people are like the thing, the product either works or the person doesn’t use it. I don’t think that this is a very probable scenario where people will be curating their own. If they get too many messages on messenger and they start to get a better experience, it’s going to come down to two things. They’re either going to curate and delete the things that they don’t need and they don’t want or they’re going to switch and use other messengers for communication with their people. The other thing is also not really probable because messengers have this gravitational pull of all the users who are already using those messengers. If your friends and family and colleagues use Facebook Messenger it’s going to be really hard not to use it. I think that the most probable scenario that’s going to get actually happen is that either nothing is going to change and you’re just going to be talking to the … you want to talk or a messenger is going to introduce a separate tab for the businesses. You would have your personal conversations on one tab and you’re going to have your conversations with businesses on the other tab. That thing I think is going to bring the open rates down because you’re not going to see all the businesses like that tab is something that you can leave unread and it’s going to affect, right now it’s really hard to leave messages unread messenger because you are trained that those messages are important that they are coming from your friends and if you have that red badge on your messenger you’re checking it like most people try to keep it on the zero. If you have a lot of things that are irrelevant that don’t require immediate action from you like messages from the businesses then that badge is going to become less meaningful. I think there is a high probably that Facebook is going to introduce another tab for businesses but when we talked to Facebook about it, they said that they have no plans to do that. I think it’s if they see, the question is if they see a drop in customer like satisfaction and user engagement, they will definitely do that because the user engagement is the most precious thing for the Facebook messenger team. If there are no users, there will be no businesses. You got to watch out for the user and right now there is just not a lot of businesses who are doing messenger marketing like it’s growing crazy but hundred thousand pages is nothing compared to 20 million Facebook pages that are using messenger right now just one on one. When Facebook sees an increase in pages using messenger marketing and if they see a job in user engagement I think they will definitely introduce some kind of filters for people to get less messages which is going to affect the businesses but is still going to leave messenger marketing the most engaging trial on the market because it’s not a matter of what tab or something it’s a matter of our people checking that channel or not. Balint Pataki: Exactly, just a couple of things that you mentioned. One of them is that it’s going to stay because of the attention. I think another thing that we don’t have on other channels on the future is the integrations that we can … businesses. The instant scheduling for them just for example or having information about delivery in e-commerce or whatnot so there’s more to this communication than the other communications besides being as probably in most countries, actually in most western countries the main source of communication between families and friends as of now. Another thing that you mentioned is that it’s going to be probably another tab and then it drops the open rates and the engagement rate and exactly that’s the reason I suggest everyone jump on it now because there’s a bigger opportunity now. They have just more room to experience and to master this skill because messenger marketing is different from email marketing. Their communication is different and you have to learn it in a way. What would you suggest for marketers that jump on messenger marketing, how do they learn the craft of making these probably smaller messages a little bit more relaxed or laid back style of messages? Mikael Yang: Yeah. I think you mentioned most important things and every channel of communication has its own tone of voice and their own context of where that communication is happening. Messenger happens in a channel where people are used to talking with their friends and family. Those communications are short and those communications are less formal. They’re much more one on one, much more personal. I would suggest experimenting bringing down that ton of voice from formal to something much more casual and keeping the messages shorter and making them interactive. That would be the third thing making them interactive, inserting buttons, inserting ways for the person to express themselves because it’s much more of a conversation and much less of a here is this thing like go and do something. It’s much less direct. If you want to have that rapport of your audience, it should be more suggestive like hey, what do you think about this and the person can express their opinion and the conversation will go down different paths. If you’re a smart marketer both of those paths will lead to the conversion event that you want the person to do but it will be a differently structured conversation. For a person who is like hey, are you only starting with bots or are you already an advance marketer? They can say I’m only starting or I’ve already built auto bots and depending on that answer you can position your product for that specific segment and say if you’re only starting out we have five like the first five lessons are on the basic things you will learn everything from the beginning and if they’re already an advanced user you say did you know that in the last five lessons we are covering some really interesting and not widely known techniques and tips and trips for advance bot marketers. It’s still the same product. It’s still the same course but you are talking to the needs of the customer. I’m not suggesting like you somehow mislead them. I’m suggesting that you provide them the value that they’re looking for by positioning your product the way that is going to solve their problems if the products is solving the problem. If it’s not, don’t lie to your customers. That’s a bad thing to do. Balint Pataki: I see it in a way that it should be like a win-win situation and for marketers we get to speak their language. It’s trust higher conversion rates and from their perspective they get exactly what they want and they don’t have to dumbler on stuff that’s unuseful for them. Mikael Yang: Yeah. Think like a salesman. If the person comes to salesman, he doesn’t have this one script for everyone that is just linear from A to point B. Most salesman think about their customer, what does that customer need? Maybe you have two products. Maybe you have a product for the beginners and a product for advanced people and if you get to know your customer you can suggest them the product that fits best with their current needs. I think that’s the power of the bots. It’s the ability to have that conversation and to basically get to know the customer and then see how you or your business can provide value to that specific case of that customer. Balint Pataki: That’s what I also often say that it’s like one on one intimacy scaled like a salesman actually being there but not limited to one person or just a couple of person in the room. One of the most requested upcoming features for ManyChat was integration with Zapier and you no doubt did it for awhile. I was actually testing within the beta and it’s awesome. We have many opportunities to link different … so if someone doesn’t know Zapier, it’s a software that enables you to connect different softwares together and pass through information through them. One of the used cases I often use is integrating with an email service so people are able to type their email addresses and then automatically put in to a separate list on your newsletter software and they get an email there. What are the best used cases that you’ve seen so far for a couple of months I guess? Mikael Yang: Yeah, it’s been out for two months I think. The best used cases would be like to get the email. Marketers are worried about Facebook controlling the communication and the channel between them and the customer so marketers want to have a backup and they do have a conversation open on messenger but they still ask for an email and put it in their list so that in case something goes wrong they still have the email of the person which is totally understandable. The channel is in beta. I think that’s one of the most frequent used cases. The other one would be synchronizing with CRM. Get on leads through messenger creating cards or like contacts in the fusion soft cards and Trello or something and then tracking those cards and updating those cards as the conversation goes on. That would be I think second one. The third one would be actually creating calculators and quizzes and really sophisticated automations through the use of Zapier. For most people it will be too complicated to set up but you can do really sophisticated stuff through our Zapier integration. Basically you can at any point inside the messenger float, you can ask Zapier, you can trigger a zap that will go out in external service, get some data and then send them back into ManyChat which allows you to basically infinitely extend ManyChat to do anything. Recently just a few weeks ago we released a new version of Zapier integration which allows you to first of all search by custom field, so now if the person fills out their email for example or a phone number in messenger and you already have that in some kind of a database like in your own CRM with their phone number or email, you can configure a length between the CRM and ManyChat and based on that email for example or that phone number, you can find the person like for example if the person moved inside the CRM to the next stage, you can actually go to ManyChat, find that person by the email and then send them a message or subscribe them to a sequence or do something. That’s pretty huge in terms of the ability to synchronize between systems and the second thing is you can now send not only text messages from Zapier but you can now actually trigger whole flows with like cards and buttons and galleries et cetera right from Zapier through a messenger. It’s pretty cool actually. Balint Pataki: Yeah. I’m actually obsessed with all of these automation opportunities and it also provides an easy way to have something from the offline word into the online words. One of the things is like events where people have these lists and you can have this Google Sheet for example and you’re able to track who attended the event and whatever interested in and exactly what you said put them on a sequence on an automation. What are some things that Facebook doesn’t allow you that you would love to build but there are some limitations that’s coming from the messenger side. For example typical would be like having only three button options or some limits. Mikael Yang: Yeah. I think the things that you can do right now, we’re only scratching the surface with what you can do with messenger. There is no one thing that I’m like only if we have this then we would give so much more value. The things that are already possible with the messenger platform are infinitely impossibilities. I think the only thing that comes to me like being able to trigger a URL from a quick reply. Right now quick reply can only trigger a message like it will be cool if a person pressing on a quick reply could open or view. But it’s not a huge thing. It’s not something that I would be like this is weird right now using messenger possibilities to I think about 5% of what’s possible with it. It’s much more about us building a platform like cases the used cases, creating the templates, creating the guides for marketers, for agencies, for businesses to enable them to get more, to become closer to their customers. Balint Pataki: Talking about that so you can expand greatly on the already available messenger functions, we actually talked about this early summer I guess. We talked about how cool would it be to filter people and have different flows for them. As we talked back they are interested in different like both markets are done just a starter, would they have very different messages than advance one but after a while you could have the same message for them but you still filter them all. What’s to know about this feature? Mikael Yang: Definitely, filtering and the ability to do logic inside the flows is something that is coming up really soon. We are already working on it so it’s not like a thing on the roadmap. It’s going to have some time, we are right now working on it and we’re going to release it soon. That will expand the things that are possible with messenger a lot because right now everything is very deterministic. The button leads to a message or it leads to some actions or something. Now there will be much more flexibility. The button could lead to different messages based on who is pressing that button which opens up a lot of avenues for creativity in terms of what marketers and business owners will be able to do with this. Balint Pataki: Some of the things that even Facebook provides, for example the time is only if you could just filter out like you do a webinar for example and then you have audience from across the globe you can still [inaudible 0:36:39] probably split it up into two parts so it’s not 4 AM in the middle of the night for them. Mikael Yang: Yeah. You can actually do that already if you’re talking about broadcasting you will be able to do that. You can target people really specifically. If you’re talking about segmenting them out using sequences or something that’s coming. Balint Pataki: Thank you. I think I will jump into the community questions because I told on Facebook groups that I will interview you. Loise asked what’s a good frequency to target repeat customers without fatiguing them? A little bit back about this fear of the people … so many brand messages, how to do it as of now. Mikael Yang: It depends on your bots. There is no right one size fits all answer to this question. We have people who are broadcasting two times a day. We have people who are broadcasting once a month and both are getting great results. It depends on what people expect from your bots, how you’ve said those expectations and do you have the content to broadcast more frequently or less frequently. The bot that was, I’m talking about the broadcast twice a day is a bot that specifically says I’m going to send you news in the morning and in the evening about this and that and this is how it works. If you want to subscribe, subscribe. If you don’t, don’t. if we are talking about just businesses in general like SMBs, restaurants, e-commerce or something, I would suggest that if you’re not creating content every day, if you’re thinking about communicating with your audience, I would suggest something along the lines of once a week, once every two weeks so that you should provide value. If you don’t have anything to say don’t just send something because you feel that you have to talk to your audience. If you don’t have anything to say don’t talk or create something that’s going to be interesting for your audience but don’t just have a schedule and like we got to send something this week so like let’s send something. People are just like you. They want to get value. They want to be spammed with irrelevant messages that don’t have any meaning. If you think about people think about what would be interesting to you, the golden rule. It’s just like market to other people as you would want to be more marketed to you. Balint Pataki: I actually wanted to add it but you said it perfectly. One of the other things that you can ask them like you can segment them on that and filter them out. You can send out for some people once a week. You can send for some people twice a day. It’s totally possible. Mikael Yang. Yup and then use that targeting to send the messages to people who wants to get twice a day or sent twice a day. Balint Pataki: Definitely and you have some conversion in mind in the future, you can also rate these people how active they are. There are some awesome features of managerial probably, some people don’t know about what’s the last interaction. You can re-engage them and ask what’s going on? Is it not actual for you anymore and then they open up in many cases. Actually I like this but right now blah-blah-blah and you have a conversation and you can get to know your customers better. Sinan asked what are the best practices for e-commerce businesses? Mikael Yang: I think e-commerce businesses should first figure the channel itself. I’ve seen two approaches. First, treat it as a better email like send shipping instigations, send receipts, send updates about what’s in stock or actually people do cart them and then through this. There is lots of things that you can do with messenger that are right now done through email and with much greater success. The other thing is use messenger for live chats. Actually talk to your subscribers. Talk to your potential customers or customers who have already bought something and that’s what messenger is made for. Email is less convenient in terms of one on one communication. It’s slower and it’s bulky in terms of you have a signature, you have an intro, it’s not this easy fast thing that is really lightweight that you can do on the go. I think using messenger as a live chat communication tool will be also one of the things that e-commerce will start doing more and more over the next year. Balint Pataki: Thank you for bringing that up. Actually, email is the electronic mail and messenger is sending just messages on chat application. That’s good to put into perspective. One of the things Facebook is probably a little bit unsure about or causes a lot of confusion is the 24 hour rule. Darryl asked what opportunities are for marketers to message people who specifically want to be on your notification list but they haven’t interacted with your bots in 24 hours but you want to send a promotion. Mikael Yang: They’ve made it really clear that even if people subscribe to your promotions, you cannot send them. What you can do I think is that I would have to check with the messenger policy team but I think what can be done is you can tell them do you want to get a reminder whenever we have news for you? Or do you want to get a reminder every Tuesday 10 AM and if they say yes then you can send them a reminder which doesn’t contain the promotion and then when they click on the reminder like saying open the reminder or chug the reminder then they’ve interacted with the bot and then the 24 hour rule opens up and then you can send a promotion as a response to that click. I don’t think that that solved the initial thing but if they are really into the bot and they actually want to get the notifications you could set up this system like this but I think Facebook is going to come up with its system to actually send promotional messages after the 24 hour rule. There’s got to be like something and I think that’s just going to be the way that they make money is like by just having some kind of a paid way to send messages. Actually, they already have a paid way to send messages. It’s called sponsored messages but I don’t think that that is working for the market because wit works more like ads and you don’t control who get the message, you don’t control when they get it. It’s like hey just show some people that interacted with my bots this message and you’re just like maybe someone will see it. Balint Pataki: Yeah. If they introduce that that would be very good to have for example the tagging system from ManyChat, they limit it and somehow import it into the Facebook probably like the ad or Facebook broadcasting for payments whatever and then you can have your segmented list there as well. Mikael Yang: Yeah. Let’s not get into the secret stuff but there is going to be I think some way to pay for the interactions that are promotional. Balint Pataki: One of the things that I came up with is asking user questions because in many of the sales processes it’s all about getting to know your customers in a way and I think when you can cleverly form a question and it’s not directly related to the promotion but perhaps you get your customers better and get to know them better and after they answer they probably have their interest as well. If they don’t answer they probably have the interest anyways and if they answer you’re within the 24 hours so that’s a good time to send your promotion after follow up. One of their questions are about if you have any special tips about list segmentation? I found list segmentations are very important and what do you see, what users have to do what are the best practices on that? Mikael Yang: We’ve introduced some of the really important ways to segment your list based on the interactions that the user had. Not only you can tag people based on the way that they pressed or didn’t press any buttons but also the way that you can actually segment that list afterwards based on those tags based on the growth tool that they’ve entered the bot exit through or based on the last user or the first user interaction inside the bot. For example you could only target people who have interacted with the bot in the last week to get the most recent users or you can have the people who have interacted with the bot in the last week but also signed up a few months ago. You are now getting active users who are your regulars or you can segment the users who have not interacted with the bot in the past three weeks so you’re getting the slipping away users who have been active but now are not. There’re definitely some really interesting ways to segment users and I think segmentation is really key to sending relevant messages to the right users at the right time. Balint Pataki: I totally agree. Every time I want to create a segmentation I think about how can I make my messages more personal and segment them according to that. If they have two different interests then they’re segment according to the interest as well. Steven asks what are the biggest mistakes that are made by messenger marketers as of now? Balint Pataki: What were the funniest situations that have arise on out of the messenger marketing? Did you see something like you were surprisingly funny or good solutions? Mikael Yang: Some of the surprising situations is that some people think that they are talking to bots and most of the time their messages are actually getting read by humans. That creates some really uncomfortable situations when for example men could send some pictures to the supposed bots which is not a bot but an actual person looking at those pictures. Our support team quite frankly has to sometimes go through those unsolicited personal photos as I might call them. Mikael Yang: I think it’s going to be like there are a lot of fun things. People behave much really different when they think that they’re talking to a bot whether compared to when they think that they are talking to a human. They know that the bot or assume, maybe in the future bots will have feelings but right now they know that the bot doesn’t have feelings so they are much more direct and much less kindness towards the bot that they say mean things to the bots. I think those kinds of situations could be considered funny when you read through them but that would be my answer. Balint Pataki: Sometimes I’m very surprised when I look at manually on the messages and I … what did you do here. Mikael Yang: For some reason people think that those conversation like they’re talking … they know that. It’s like it’s a business page. They’re sending messages to a business so they know that those conversations are in some way private or something because businesses have different people working in support et cetera. Sometimes when people posts particularly really mean things to the bot you just want to go like screenshot that. Maybe send them a reply, don’t do it. We are actually people sitting here. Balint Pataki: I actually setup a standard message in Facebook inbox that please mind your language. Actually one of the things that I appreciate about you also comes along with the marketing focus that ManyChat has is that you are most likely a messenger marketing platform and not a bot reading platform in a way. How important do you think that people are forward about like is it are you talking to a bot or the messages are answered by people because if it is buttons and instant answer, sometimes there is this confusion and people aren’t sure about that. How open should the businesses be about that? Mikael Yang: I think they should be pretty open. There are buttons like people don’t send buttons to each other. People send messages and they talk and they communicate and they figure out what they are going to do together. I don’t think that it’s a secret that whenever you are getting a message with buttons like it’s automated and be talking to you. I think it should be noted that sometimes it’s going to be a bot sometimes it’s going to be a person and the difference should be clear to the customer so that they know what to expect and how to interact with this either person or a bot. I don’t think that marketers should be hiding the fact that this is not a … like you are not hiding them and it’s not automated. If you’re doing a broadcast, an email broadcast, is that an automated message? Yeah, it’s going out to a thousand people but you wrote it. I don’t think that’s automated. I think sequences could be considered automated because everyone is getting this input. Again, you wrote that message like if it’s a like consider an educational course. A seven day crash course and Facebook marketing like you’re signing up for the course and then you’re getting the messages. Yes, the messages are automated but as a person you are expecting like I don’t think that somebody is expecting the teacher to be there exactly seven days after the person subscribed sending them a personal message manually. I think the distinction should be clear to the customer and I think that there is already a lot of hints about is that bot speaking or is it a person speaking. Balint Pataki: Exactly, that is always also my answer and it should be obvious from the context about what’s going on because if they just engage with the bot and they have personal questions and they get an answer even if I don’t sign it it’s a personal answer. Mikael Yang: Sometimes people start to talk through live chat with people in there saying is that the bot asking me and you’re like no, it’s me, it’s Mike. I just want to know this thing. Soon those are going to be bots. AI is going to get to the next level where it’s going to be like now we actually have to somehow make sure that people are understanding is that the bot speaking or is it a person speaking. Balint Pataki: The way I do is if I answer in a time limit so it could be also bot. Sometimes I just have it open as a tap. I definitely sign it but it’s me after the first message but if it started conversation then yeah, they should know that it’s me on the other side. Thank you. These were the community questions and I asked every guest of the podcast, there are so many interesting people in the industry in developing chatbot, having knowledge about the marketing, who would you nominate as our next guest? Mikael Yang: I would nominate Molly Pittman. She started talking about messenger bots a long time ago and she knows about messenger marketing more than I do. She started a lot of content about it when nobody knew about ManyChat or messenger marketing specifically and she knows how to get results. She was the one to get 500% ROI for digital marketer using messenger marketing. Definitely, I would nominate her. Balint Pataki: Okay, thank you. I will definitely invite her because actually, she made me check out ManyChat again back in last year I was like yeah it’s good but probably there are other options and she was always talking about ManyChat. I’m like I should probably just give it a second time and I didn’t regret that. Thank you. If people are interested in ManyChat what shall they do, what’s the next step in a way? 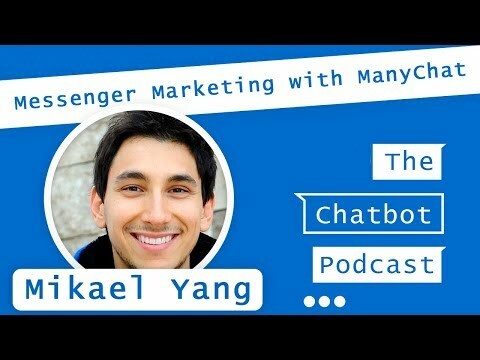 Mikael Yang: Go to manychat.com, it’s M-A-N-Y-C-H-A-T.com and check out ManyChat. It’s free. Login with Facebook. Connect like any page or create a test page, doesn’t matter. Just send your first broadcast to yourself. Just feel the power having a way to send a message to all your messenger subscribers with this visually without having to code anything. If you want to grow your business, if your business is if you think that your subscriber is your customer are using Facebook Messenger or just Facebook in general just I think you will really like it. The next step would be to go to ManyChat, we have unlimited free plan like there is nothing to it. It’s just like go check it out. If you like it you’ll like it. If you don’t just like close, nothing happens. Mikael Yang: We have a new onboarding in place, which… actually did you, see that? Balint Pataki: I just saw the new landing page or the new design of the page. Mikael Yang: Yeah. If you connect, your account is already connected. If you see one of your clients or somebody connects like their first page, you will see that we have a new onboarding which is pretty cool. It walks you through the setting up here, your welcome message thing, your first broadcast and it’s pretty awesome. Balint Pataki: Okay. Probably next time I will just sit next to a client and show things around. Amazing, thank you for your time and you shared your insights with us, thank you very much. Mikael Yang: Thank you for having me. Balint Pataki: Thank you, bye. I hope you like the interview. You can find the links and the full transcript of this episode at chatbottutorial.com/4. I would love to continue the discussion so please comment under the post or leave us a review on iTunes to support the podcast. Also, you can ask questions for the upcoming episodes that me or my guests can answer for you. Just hop over to chatbottutorial.com/ask and they will record your question there. If you’re interested in learning more about messenger marketing, I regularly host a free live training online. You can sign up via chatbottutorial.com/webinar. Thank you for your attention and talk to you in the next episode. Very well written – bots will be the primary interaction channel of the future and holds a lot of promise against current and traditional formats. The challenge is to make the interaction design more intuitive, demystify the tech / engineering side to bring it into more acceptance of the masses by displaying value, and increase utilization for business cases. The 24×7 self service and intelligent nature of the format is already being used for customer service, conversational commerce, health tech and education. Dear Balint, Thanks for written this tutorial. These kinds of Chatbot tutorial will very helpful for chatbot developers like me. Currently, I’m on working on a facebook chatbot development. Balint on ManyChat Vs Chatfuel: What’s The Difference in 2018? Priyanka Prakash on ManyChat Vs Chatfuel: What’s The Difference in 2018? ManyChat Vs Chatfuel: What’s The Difference in 2018? Copyright 2018 by Chatbot Tutorial. Chatbot Tutorial is a brand of Grow Big Marketing LLC.